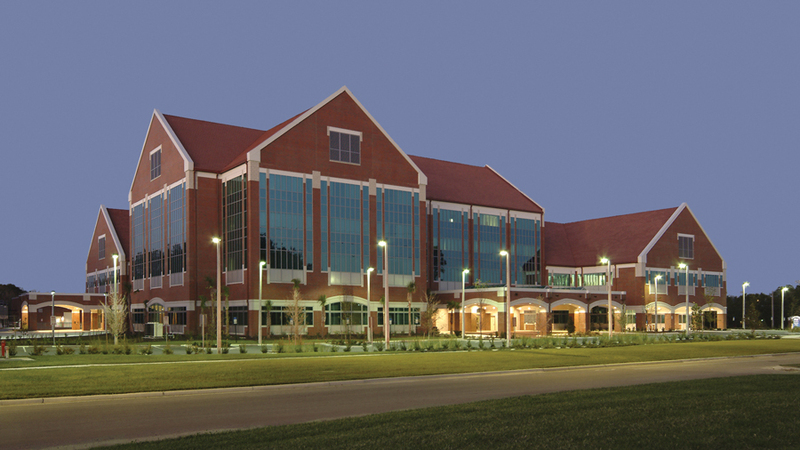 Champions at the University of Florida – whether in sports or science – are built on a lemon-lime foundation. From the Orthopaedic and Sports Medicine Institute to the Center for Exercise Science and the College of Medicine, scientists have teamed up to study the human body’s response to exertion – from elite performance to injury – following in the footsteps of Gatorade pioneer Dr. Robert Cade. There’s Mike Jansen, a Gator swimmer turned cardiologist, who couldn’t get away from Gatorade during his UF athletic career. And Scott Powers, a college distance runner in the early 1970s, who remembers the “off” taste of the first formulations, and who met the Gatorade inventor when he arrived at UF as a young exercise physiologist. And former gymnast and swimmer MaryBeth Horodyski, who enlisted one of the original Gatorade guinea pigs, head ball Coach Steve Spurrier, in research with her graduate students on heat stress in football players. At UF, the quest to know more about the effects of exercise on the human body started with Gatorade, but it didn’t end there. 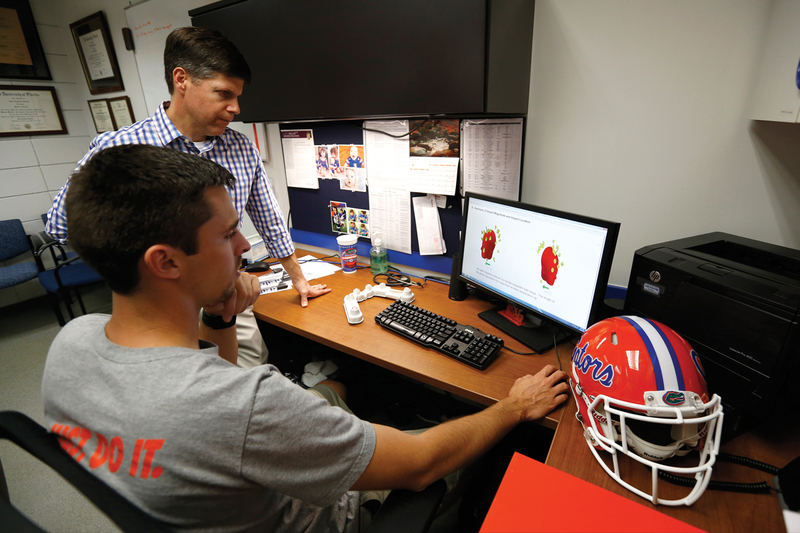 As Gatorade’s reach has grown – powders, chews, gels, protein shakes and protein bars, gum, G2, and flavors galore – so has UF’s sports and exercise research enterprise. Horodyski is the research director at the Orthopaedic and Sports Medicine Institute, or OSMI, one of perhaps four labs of its caliber in the United States. It has force plates, 22 state-of-the art cameras for motion capture, instrumented treadmills, masks, sensors and computer programs run by faculty researchers and a biomedical engineer – all turning motion into science. Studies on football, baseball and basketball are ever popular. But so are running, swimming, gymnastics, softball, tennis, volleyball, lacrosse, soccer, golf, cycling, even archery. Although no one has asked – yet – UF sports scientists have room in the cavernous motion analysis lab at OSMI to examine the motion of an angler casting a fly-fishing line. The research portfolio is vast, but one of Horodyski’s projects with Spurrier carried on a tradition the coach himself helped start. Horodyski and her students needed football players for heat stress research in the late 1990s, and where better to find them than Florida Field? Spurrier agreed, as had his own coach, Ray Graves, who tested the first Gatorade formulas to hydrate his players. 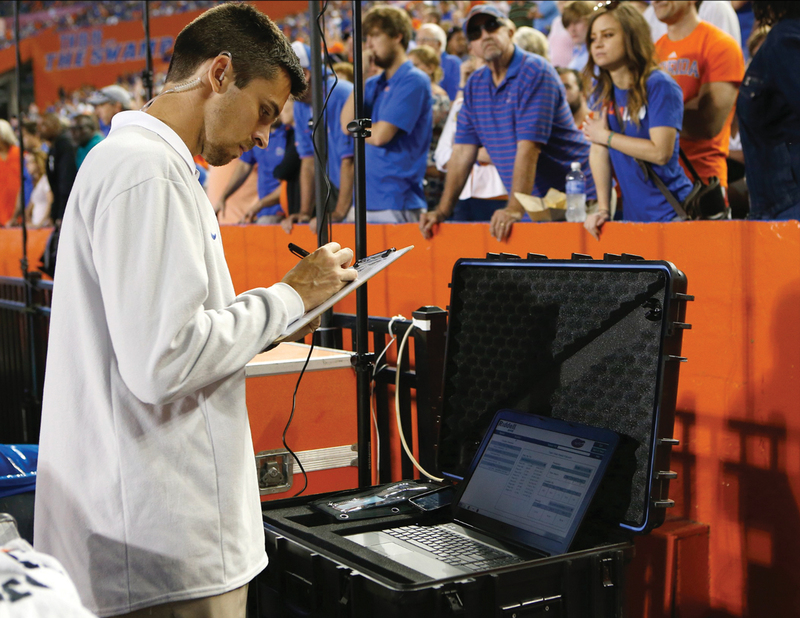 Horodyski wanted Gator players to swallow a sensor three hours before kickoff. The sensors’ radiofrequencies would send measurements of the players’ heart rates and core temperatures to a computer on the sidelines. “The players just played. They came on and off the field with no distractions,” says Horodyski. Spurrier’s only concern was getting home from a road game through airport security with players who had a sensor meandering through their gastrointestinal tract, so Horodyski sent a graduate student to the Gainesville airport for a little test. The sweltering environment of The Swamp was the inspiration for another idea – the air-cooled shoulder pads in use on the sidelines today. Designed by UF researcher Nikolaus Gravenstein and a team that included former Gator player Michael Gilmore, then an orthopedic resident, the pads were tested at OSMI. Football players have a microenvironment underneath their shoulder pads and helmet. Once the game starts, particularly in The Swamp, the humidity level goes off the charts. “They get soaking wet, and get very, very, very hot, very fast, with no way to cool down,” Horodyski says. The air-cooled shoulder pad system blows cool, dry air through the pads. That dries the shirt and takes advantage of the body’s natural method for cooling – evaporation. Football fans who look closely can see the pads at work on the sidelines: When a player reaches the bench, a student runs up and hooks a blue coiled line to the shoulder pads. When he returns to the field, the player unclips the line. To test the pads, OSMI developed a heat room and asked former players to run on a treadmill in shoulder pads. Air cooling beats systems that use water, Horodyski says, because unlike water, air does not add weight to the pads. 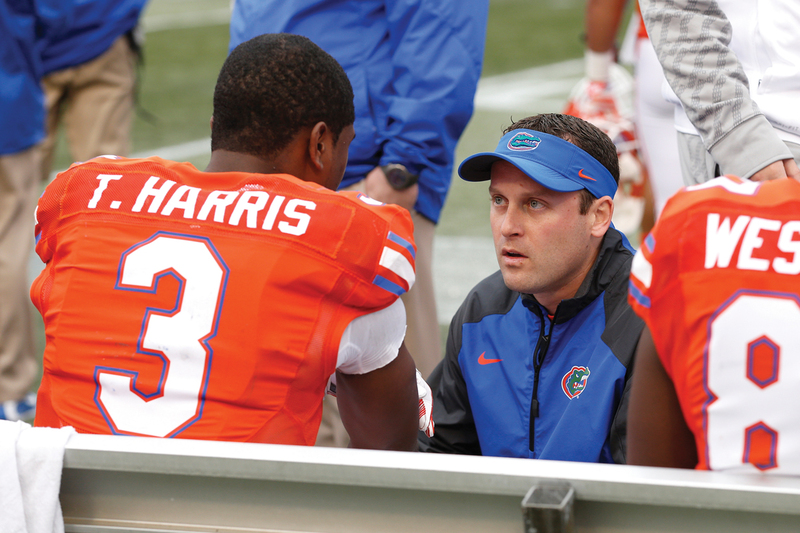 Horodyski’s latest research involves spine injuries, a topic that made Gator news in the spring with the untimely retirement of UF offensive tackle Rod Johnson. Johnson was diagnosed with congenital cervical stenosis, narrowing of the spine, following a practice injury. Horodyski is studying spine boards of different types and protocols for using them, and has also evaluated a new shoulder pad design that allows the pads to be removed with minimal motion, a key factor in keeping a spine injury from worsening. In 3 to 25 percent of cases of paralysis following a sports injury, the paralysis may occur when preparing the athlete for transport to the hospital. “My goal is to prevent that second injury from happening,” says Horodyski. The new, ripcord shoulder pads make it possible to remove the pads without moving the player. Horodyski had commented on the need for new shoulder pad designs at a lecture in Chicago, and nine months later got a call from an athletic trainer who had been in the audience. He asked her to test the pads, and now the pads are hitting fields across the country. “You never have to lift the person, roll them, anything. They can be lying down, you pull a cord, and the straps in the back detach, so you can pull the pads off from the sides,” Horodyski says. Across campus, at the College of Medicine, Jansen says he enjoyed his status as a test market for new Gatorade products in his swim team years, 1998-2002. Some of the products were odd, he says, but a super-sweet product called a Go shake was his favorite. Jansen’s interest is sudden cardiac death in athletes, sparked in part by the on-court death of basketball star Hank Gathers in his childhood. When he retired his suit to go to medical school, he became an electrophysiologist, an “electrician of the heart,” as he calls it. He is looking forward to a new initiative, a UF Health Sports and Exercise Cardiology team starting in August at UF’s Springhill offices. Nearby Santa Fe College athletes will be tested there, said director and cardiologist Floyd Burke. That program, added to datasets from tests of athletes at UF and elsewhere, could push the frontiers of what is known about the hearts of athletes, Burke and Jansen say. Athletes’ hearts can be a bit thicker and more enlarged, and even look like the heart of someone who has had hypertension for many years, leading to further testing that is unnecessary or to a mistaken diagnosis of disease. For the past three years, the University Athletic Association has conducted EKGs and echocardiograms of all freshmen and transfer athletes, a database that Jansen says may one day be ripe for data mining. About half of NCAA BCS conferences also test, and Jansen sees potential for building a conference-wide or even national database. 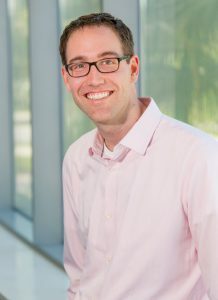 Although Jansen has reservations about over-testing, as long as data is being collected, it should be used for research. The issue, he says, is whether testing could cost an athlete a shot at success. Exercise, naturally, is not just the domain of athletes these days. Its benefits extend from the Michael Jordans of the world to the John and Jane Does, and that’s where the Center for Exercise Science focuses its research. Center director Powers recalls Cade working with members of the Department of Applied Physiology and Kinesiology on various projects. While Cade knew Gatorade would have to succeed with football to hit the big time in the Deep South, he knew endurance athletes would benefit, too, Powers says. As a former college distance runner, Powers says, he understood the benefits of Gatorade, despite its early taste, and later, as a member of the Gatorade Sports Science Institute for a decade, he provided input on sports nutrition products and watched Gatorade morph from a drink for athletes to a drink for the guy mowing the lawn. Just as Gatorade reached the masses, so did the early sports and exercise physiology research. “We believe the most important research contribution we can make is why exercise is protective of health and how we can best use that information,” Powers says. The Orthopaedic and Sports Medicine Institute is one of a handful of highly equipped labs that analyze athletic performance and provide injury rehabilitation. Indeed, Horodyski says, the elite labs at OSMI are open to weekend warriors, not just the top-notch athletes, although she remembers spaces perhaps less grand. Horodyski says when she arrived at UF in 1992, her first lab space, coincidentally, was in an area used to store the original cans of Gatorade, which was so potent that some of it seeped through and left rings on the shelves. 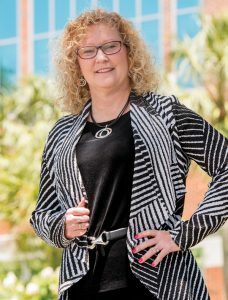 The move to the high-tech institute building in 2004 was a big leap forward for UF sports research, Horodyski says, adding that she designed the lab with input from other researchers, all with some sports in their background. As a result, the lab is a go-to stop for Major League pitchers recovering from an injury. Gymnasts do handstands on the force plates and volleyball players with markers demonstrate hits with a real volleyball net. Elite runners show up for the Running Medicine program and can either use the pressure-sensitive track or the treadmill, which operates horizontally and at an incline but also, unusually, on a downhill slope. And the retiree running a first 5K can come, too, to learn more about foot strike and stride and pace. And, of course, they all bring their Gatorade. The University of Florida is one of 11 original NCAA programs invited to participate in a landmark concussion study. The $30 million study is funded by the NCAA and the Department of Defense and will include the four service academies as well, along with additional NCAA programs in the future. The goal is to enroll 37,000 participants to study the long-term impact of head injuries on athletes and soldiers. A concussion is a traumatic brain injury that can cause headaches and problems with concentration, memory, vision, balance and coordination. Clugston has studied concussion since 2005 and works closely with athletic trainers in all sports, with an emphasis on football, women’s soccer and women’s lacrosse, the sports at UF that produce the most concussions. The University Athletic Association plans to add testing for men’s and women’s basketball. “We felt like this was an area where we could really make an impact for our student-athletes,” says Lynda Tealer, UF executive associate athletics director for administration. A primary component of the joint study is to build a more comprehensive data bank. UF has had its own concussion data bank since 2013, with retrospective data that dates back to 2005. To gather data, each of UF’s 500 or so student-athletes is given baseline tests at the Sports Concussion Center prior to participating in his or her first practice. The UAA also has been studying blood biomarkers to detect concussion since 2011 when it partnered with UF spin-off company Banyan Biomarkers. The project has evolved in recent years to include advanced magnetic resonance imaging techniques as well as in-helmet sensors to measure the impact of hits. 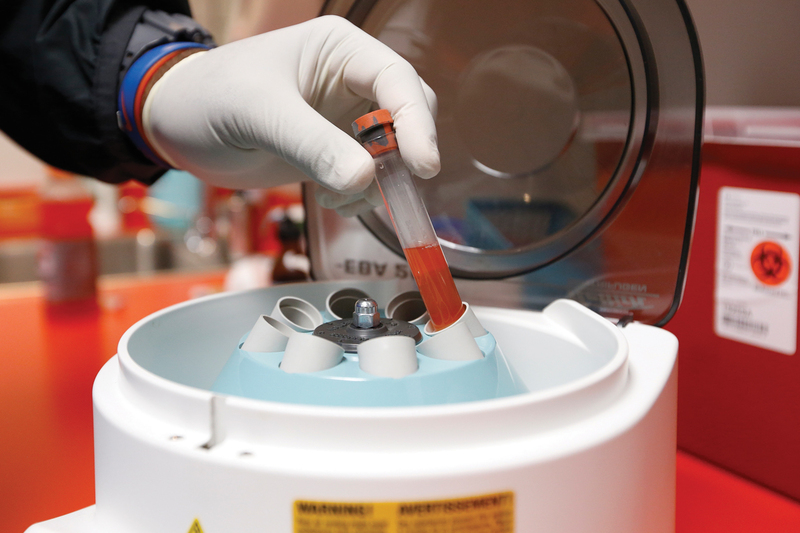 Athletes who choose to participate can give a blood sample, which is processed and stored inside a minus 80 degree Fahrenheit freezer located in a locked room adjacent to the football team’s training room before it is shipped to a lab for testing. Once athletes give a baseline sample, blood is collected again if they suffer a concussion to see if there are increased levels of several proteins in their blood. According to various studies, increased levels of protein markers signal potential damage to the brain and researchers are trying to learn more about whether the proteins are reliable biomarkers to gauge presence and severity of concussions. As athletes across all sports have become bigger, faster and stronger, concussions continue to be an issue despite technological and design improvements in modern equipment.